In the background, a Royal Aircraft Factory R.E.8 in flight. 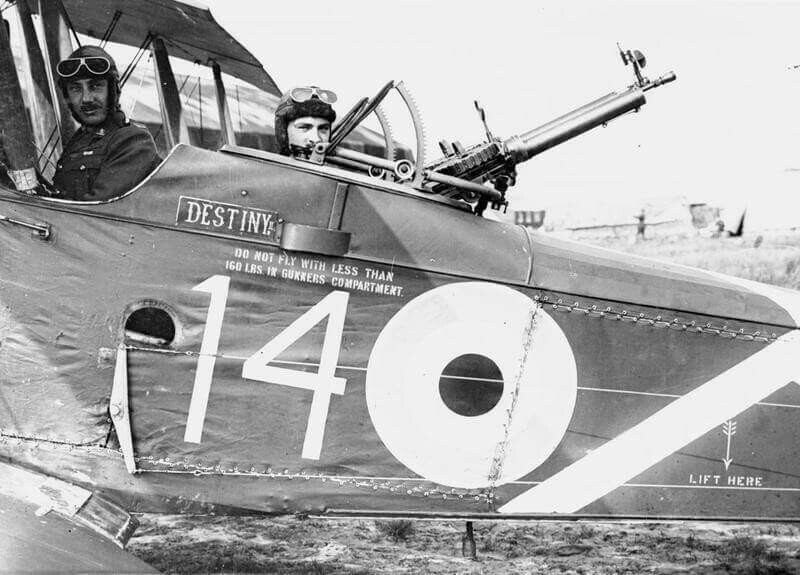 The photo, courtesy of the Provincial Museum of Alberta, is part of a Flickr collection of photos of WWI airplanes and aviators taken by Albertan members of the Royal Flying Corps. The illustrated coin is the circulation strike. 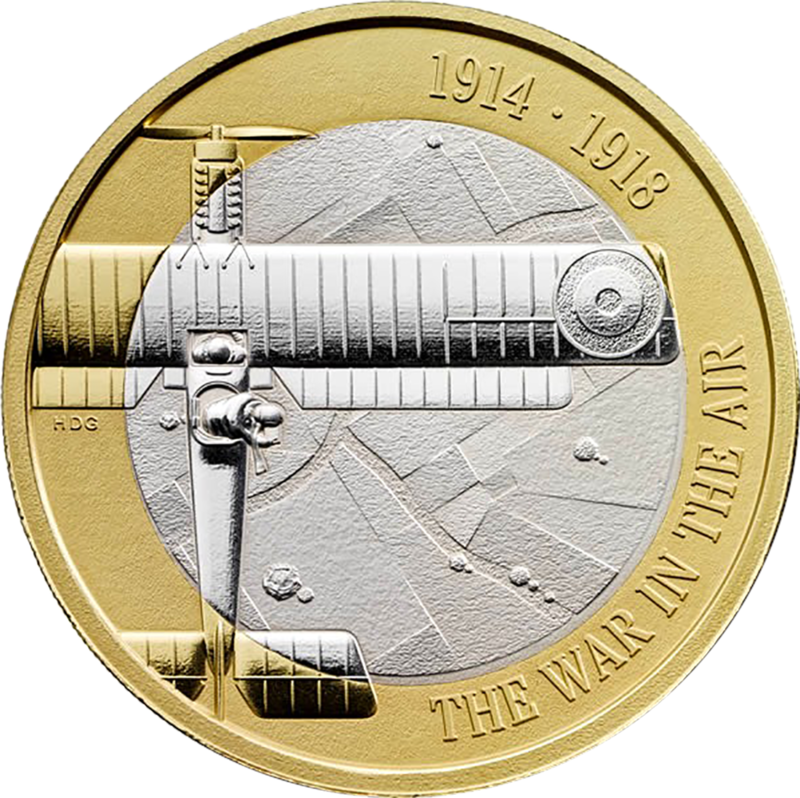 The Royal Mint have issued their latest £2 commemorative coin in a variety of precious metals, including a silver piedfort example, as part of their five-year-long tribute to the centenary anniversary of the outbreak of the First World War in 1914. 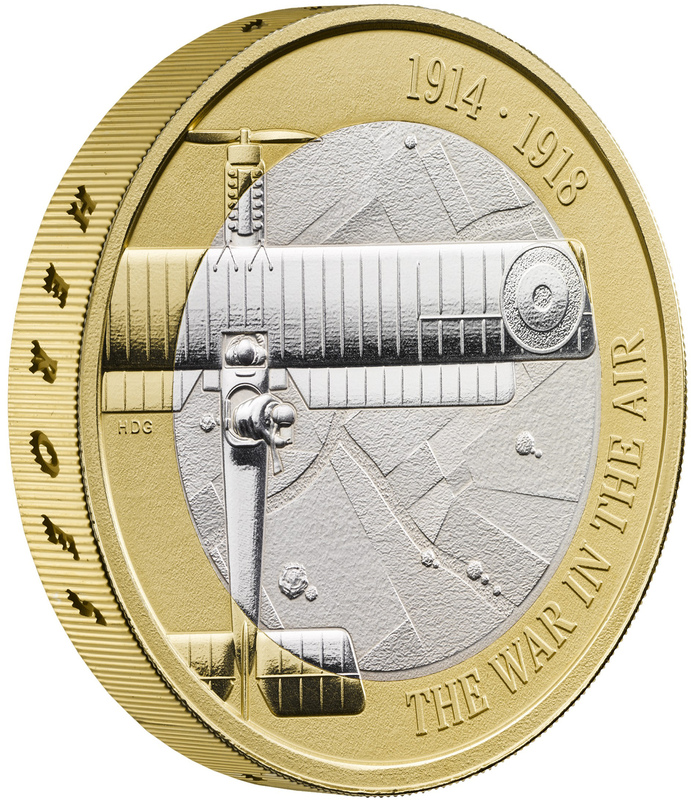 Their First World War collection continues with the 2017 Aviation £2 coin, marking the contribution of aviators during the conflict, which ushered in a new method of fighting not previously seen before. At the time of the outbreak of the First World War (or, as it was referred to after the conclusion of the fighting, the Great War), few people believed that aircraft would or could play a major role. Hot-air balloons had been used for observation and reconnaissance for almost 100 years, and it was thought that airplanes would serve a similar purpose. The Royal Flying Corps, the aviation branch of the British Army, began its life as an “eye in the air” whose primary function was to report on the positioning of enemy forces and provide a tactical advantage. It grew from a force of a few hundred aeroplanes in 1914 into a huge, independent air arm of thousands of combat and support aircraft. 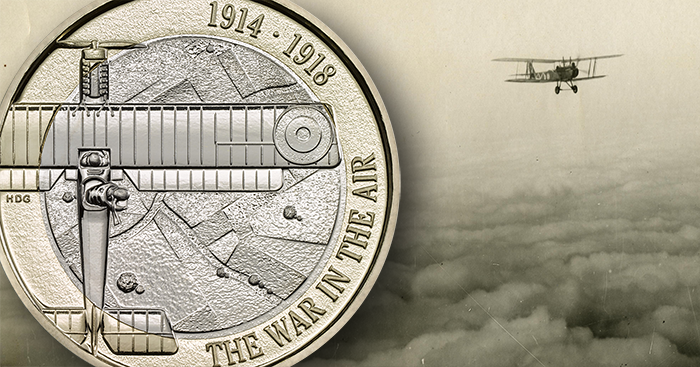 In 1918 the Royal Flying Corps became the Royal Air Force we know today, and it has defended the skies of the British Isles and beyond ever since. Reverse of the silver Proof (hover to zoom). The coin was designed as a collaborative effort between Henry Gray and Dan Flashman of the agency tangerine design. (Incidentally, the grandfather of tangerine’s director, Dan Flashman, actually flew reconnaissance over the trenches during the war.) This clever design offers us a bird’s-eye view of the plane’s two airmen—a pilot and his observer of the Royal Flying Corps—in a Royal Aircraft Factory R.E.8. (The RAF Museum has more information about these planes.) They are performing a reconnaissance flight over an area of the Battle of Arras in April 1917. The land below the plane is shown as a map, which helps to strengthen the narrative of this particular moment in history. Edge lettering on the coins reads THE SKY RAINED HEROES. The base-metal circulation strike has an inner disc of cupro-nickel and an outer ring of nickel-brass. The silver Proof strikes have gold plating on the outer ring. With the gold coins, the inner disc is composed of 22-karat yellow gold, while the outer ring is 22-karat red gold. All are endorsed by the Imperial War Museum. Obverse of the gold Proof (hover to zoom). 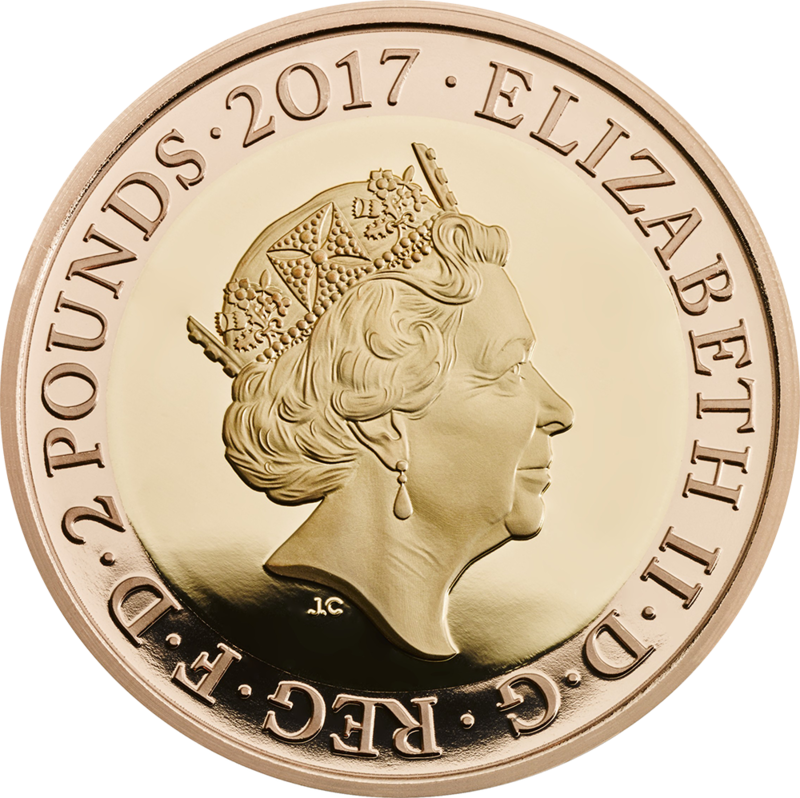 The obverse bears the fifth numismatic effigy of Her Majesty Queen Elizabeth II used on British coinage since 2015 as created by Royal Mint coin designer Jody Clark. The common-strike bi-metallic coin will enter circulation later in 2017. The gold and silver coins are encapsulated and presented in custom cases with certificates of authenticity, while the Brilliant Uncirculated examples are presented in colourful blister-pack folders. Reverse of the piedfort coin (hover to zoom).